The U.S. Navy has announced the installation of aircraft carrier USS Gerald R. Ford's first advanced weapons elevator, the service branch said Wednesday. 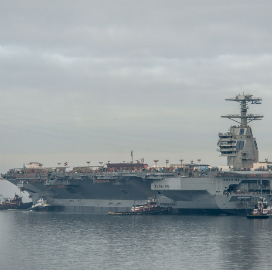 Its newest carrier received the AWE on Dec. 21 after engineers from Huntington Ingalls Industries completed certification and testing activities. AWE units of Ford-class aircraft carriers use electromagnetic, linear synchronous motors to perform elevation, unlike those in Nimitz-class carriers that rely on cables. The new AWE is designed to carry up to 24K pounds of artillery at a speed of 150 feet-per-minute, allowing for faster elevation compared to Nimitz-class carriers. The ship is undergoing post-shakedown availability procedures at HII's facility in Newport News, Va. 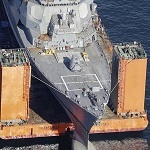 Engineers will install the 10 remaining AWE units before the ship's PSA completion slated for July.